I first heard about the Philadelphia Veterans Multi-Service and Education Center (PVMSEC) when I met two long-time supporters of the organization, Jonathan and Laura Faller. Right away, I realized that PVMSEC is an important part of the greater Philadelphia community. The Center helps Veterans through a wide range of free services such as training for employment, resource assistance, healthcare and benefits counseling, Veteran transition assistance and support for homeless Vets. Not long after that first encounter, Chris Duffy (Peirce’s Chief Information Officer) and I set up a meeting to learn more and see what we could do to help. 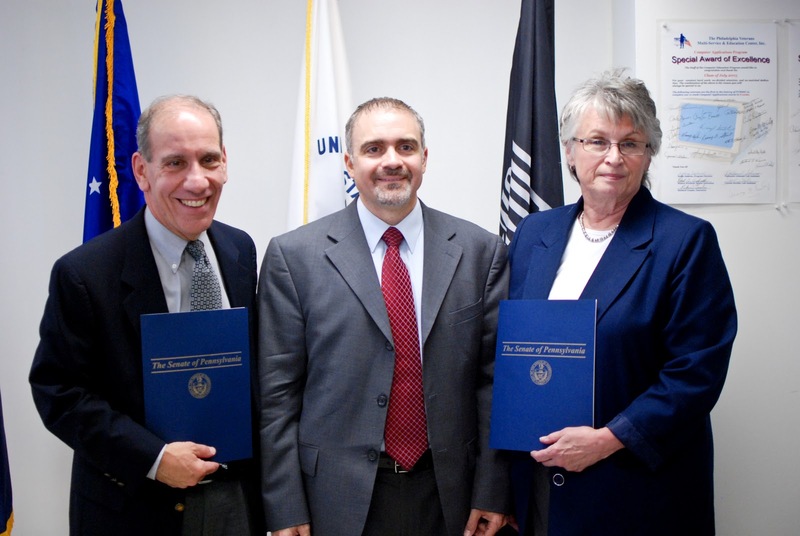 Peirce is committed to educating service members. 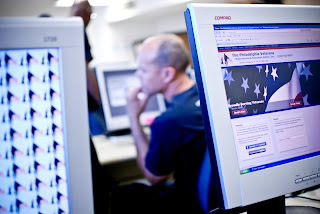 In fact, we’ve been providing training and education for returning Veterans since the years after the Civil War. 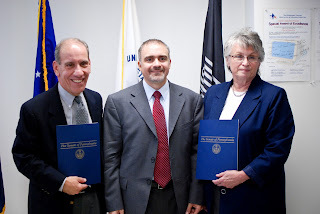 This longstanding tradition, coupled with the College’s history of providing practical higher education for working adults, seemed to align perfectly with the mission of the PVMSEC. 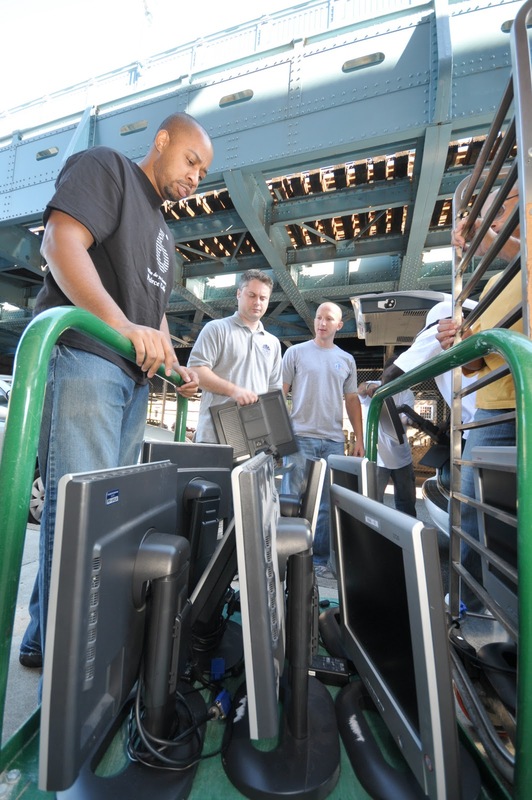 stack computers beneath the Ben Franklin Bridge. The next step was deciding where to start, and determining what would make the biggest difference for the Veterans served by the PVMSEC. The logical first step was to offer our IT expertise. 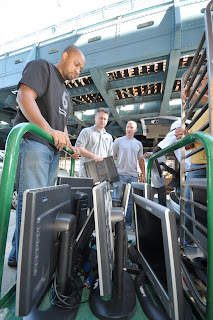 On Saturday, Sept. 18, Peirce College had the honor of delivering more than 40 computers and related equipment to the PVMSEC. Going forward, Peirce is also assisting the PVMSEC’s IT staff in upgrading their network and building a stronger IT infrastructure so they can better serve and support the Veterans. Representatives from both Peirce and the Center were in attendance to help with the unloading, transfer, and setup (check out more pictures on our Flikr page). Anthony Mannino, Chief of Staff for State Senator Larry Farnese, was a special guest at Saturday’s event, presenting both Peirce and the PVMSEC with State certificates of appreciation. 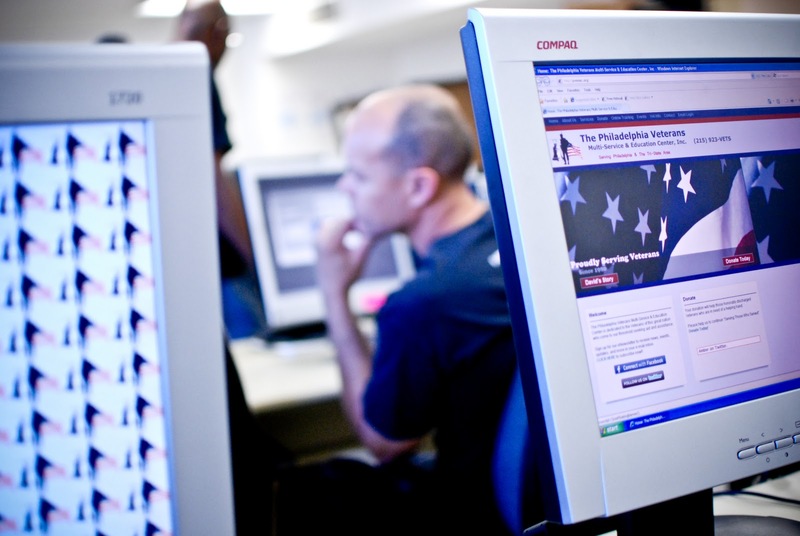 Veterans will be using the Peirce-donated computers and equipment in their various training classes. 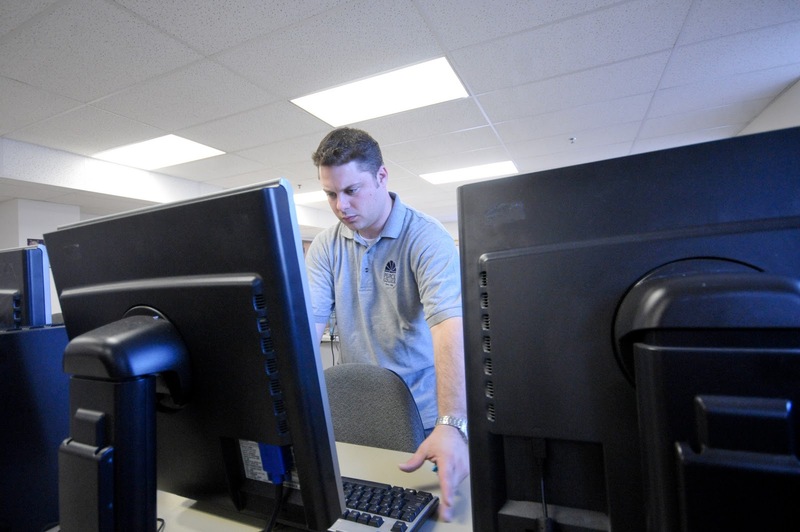 Access to this updated technology will make work and training courses much easier for veterans, and closer to what they would find in employment situations. and PVMSEC Executive Director Marsha Four. Among their many much-needed resources and services, PVMSEC offers a six-week green business solution class, a 10-week computer repair class, and a five-week IT training academy. They also provide workshops on resume writing, interview techniques, financial and budgeting skills, and life skills. Supporting these efforts is an investment in the future of Philadelphia. Peirce knows that helping individuals helps communities, and is proud to work with an organization like the PVMSEC. A special thanks to all who were involved in making this happen, and of course to the PVMSEC staff and Veterans for opening their doors to us. in their job training and education classes. Happy 145th Birthday, Peirce College!